I wanted to test out Fedora 10 released just a couple days ago. Instead of dual booting, I tried Virtualbox to run another Linux distribution on my Ubuntu powered desktop. The installation of Virtualbox requires downloading the OSE modules for the current Linux kernel. The installation of Virtualbox was straightforward. I have done it before. No sweat. I went ahead and installed Fedora 10 without a hitch. No problems were encountered. I even figured out how to increase the display resolution from 800×600 to 1024×768. Then, last night I saw a large red arrow pointing down on my menu panel. It means a Linux update is available. I clicked on it to initiate the update. It turned out to be a kernel update. A reboot is necessary after each kernel update. After the reboot, Virtualbox no longer works. What happened! I realized the OSE module installed was for the previous kernel. I searched for the new OSE module. It’s not available. I went to the message boards and saw this instead. It looks like the kernel module has to be recompiled each time a new kernel comes out. The new OSE module is not in the repository. In the meantime, if you run Virtualbox and you just received a kernel update. Your out of luck for a few days. Not until a new Virtualbox OSE module is made available. I wish Ubuntu fixes this issue. Each time a kernel upgrade is required, the Virtualbox OSE module should also be compiled and updated along with the kernel upgrade. Micro Center is a computer retail chain with 21 stores located nationwide. If you shop at Micro Center, check out their online catalog. You can check out their latest deals especially the After Thanksgiving Day Sale. If you haven’t been to Micro Center, there might be one near you. Check out their store locations. The hottest items are going to be Netbooks and Blue-Ray DVD players which I can’t seem to find the link at the moment. If these items don’t suit you, check out the latest wireless networking equipment or any Black Friday deals this weekend. A Sceptre 22 inch LCD Display is $119 after a $40 dollar rebate. A Brother HL-2140 laser printer is only $49. A Trendnet 54Mbps 802.11g USB Wireless adapter sells for as little as $4.99. Bargains! Why would somebody in their right mind run Internet Explorer in Ubuntu. Before you shoot me, let me at least explain the reasons why. I get many support questions from people regarding the themes I’ve designed. The questions oftentimes are IE related. I either have to power my laptop or go to another computer to view the irregularity. To avoid the hassles of firing up another computer (my desktop is solely running Ubuntu), I installed Internet Explorer 6 which runs under Wine on my Ubuntu 8.04 desktop. I used a simple script I found from 64 bit Jungle. The script calls for Wine and cabextract to be installed, followed by downloading the program, untarring the file and firing up the GUI installer. The installation script was straightforward and a breeze. No hitches whatsoever. The GUI installer gives you several choices. 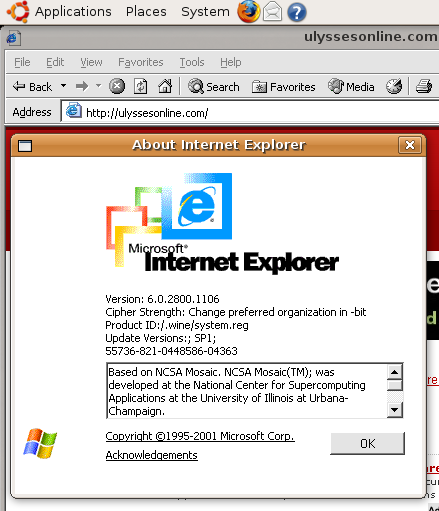 I’ve decided to install both IE6 and IE7 beta. IE6 worked out of the box without any problems, while IE7 beta choked. The IE7 beta program fired up, but the browser was not rendering any web pages. It seems to be stuck in forever land. So, the whole reason for this exercise is having the ability to check how web pages are rendered in IE6 without ever leaving Ubuntu. Running IE6 for just a few minutes makes me appreciate Firefox more than ever.